The MOTU 8Pre FireWire audio interface delivers everything you need to turn your computer into a powerful 24-bit, 96kHz digital audio workstation. The MOTU 8Pre provides eight microphone/instrument preamps with pristine 96kHz analog recording and playback, combined with 8 channels of ADAT optical digital I/O. Expand your system by connecting additional MOTU 8Pres or other MOTU FireWire audio interfaces. The MOTU 8Pre FireWire audio interface delivers everything you need to turn your computer into a powerful 24-bit, 96kHz digital audio workstation. The MOTU 8Pre provides eight microphone/instrument preamps with pristine 96kHz analogue recording and playback, combined with 8 channels of ADAT optical digital I/O. 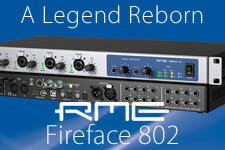 Expand your system by connecting additional MOTU 8Pres or other MOTU FireWire audio interfaces. Use the included CueMix™ software to mix all 16 inputs from your computer. Eight channels of ADAT optical I/O make the MOTU 8Pre an ideal companion for a digital mixer. Two ADAT lightpipe connections work together to support a full 8 channels of optical digital I/O at any sample rate up to 96kHz. Connect all of your studio gear, including microphones, guitars, synths, keyboards, drum machines and even effects processors. Then monitor all of these live inputs via the MOTU 8Pre's main outs or headphone jack — with virtually no monitoring latency and no processor drain on your computer. 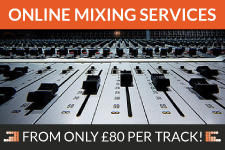 You can even create separate monitor mixes for the main outs and headphones. Control everything, including talk-back and listen-back, from the included CueMix Console™ software, just like a large studio console. The MOTU 8Pre includes a 16-channel MIDI interface. Simply plug in your FireWire cable, and both MIDI and audio are ready to go. Connect any MIDI device, such as a controller keyboard, synth module, automated control surface or drum machine. Timing is sample-accurate with supporting software. The MOTU 8Pre provides cross-platform compatibility with Mac OS X 10.3 or higher, Windows XP and all of your favorite audio software and host-based effects via WDM/ASIO/Core Audio drivers. Or you can use the included AudioDesk workstation software for Mac OS, with 24-bit recording/editing and 32-bit mixing/processing/mastering. The MOTU 8Pre is really two products in one. When it is not connected to a computer via FireWire, the MOTU 8Pre functions as an eight-channel analogue to digital (optical) converter. Connect the MOTU 8Pre to your MOTU 828, 896, Traveler or even another MOTU 8Pre via the optical 'lightpipe' connection to add eight high-quality microphone pre-amps to your system. Since the connection is digital, 100% pristine sound is maintained, down to the very last sample. The MOTU 8Pre is the perfect way to instantly add eight more mic inputs to any audio interface or digital mixer with optical I/O. If you have a MOTU interface with on-board CueMix DSP mixing, such as the 828mkII, 896HD or Traveler, the MOTU 8Pre inputs appear directly in the host interface's CueMix mixer to becomes a transparent extension of your system, operating together with your primary interface as a single, integrated unit — even when the host interface is not connected to a computer and is instead operating as a stand-alone mixer. If you have a 2408mk3, digital mixer or other audio device that supports 96kHz optical and also has two optical inputs, the MOTU 8Pre connects to it via both optical ports to provide a full eight channels of analogue to optical conversion at the 88.2 or 96kHz sample rates.